Recently, a digitally savvy colleague of mine decided to pop into her wireless carrier’s neighborhood retail store for the first time to upgrade her phone and plan. Once she found the store, she signed in on a paper list, stood around awhile before being seen, provided information that was already in her account profile and was asked questions that were difficult to answer. She was glad to leave the store and has no intent to ever return. Now, imagine that her experience took place at a bank branch…because it did. For that visit she had two goals: She wanted to know her options for a home equity loan and to exchange a dozen large bills for smaller denominations. Again, the customer experience was so poor that she will try never to visit a bank branch again if she can avoid it. It’s not that customers are opposed on principle to visiting bank branches. In fact, in a new Accenture survey of 47,000 banking and insurance customers across 28 countries, 60 percent of survey respondents said they have a positive attitude toward bank branches, and 60 percent also want to see their banks blend physical and digital services for speed and ease. Interestingly, 66 percent favor face-to-face interaction with their bank and 65 percent are even willing to pay for an in-person consultation. The preference for branch-based engagement varies country by country, but what is consistent is the expectation that when customers do go to a branch, they will have a warm, highly personalised, and engaging experience, rather than being made to feel like a cog in a bureaucratic machine. While much press attention is focused on the success of digital challenger banks around the world and the speed with which incumbent institutions are shutting branches (for example, in the UK, more than half of bank branches have closed in the last 12 years), our research shows that bank branches can still play an important role in the digital economy. However, if they are going to add value, their role needs to change. With the decline of cash transactions in many markets, traditional counter service is becoming less important (although still vital for many small businesses) and the traditional relationship between branch share and deposit share in a local market has broken down. Instead, bank branches need to be redesigned to become an “experience store network”—a connected group of highly visible, digitally enabled, multi-format, market-specific environments that offer a positive and personalised experience that supplements and compliments customers’ digital experience (particularly when it comes to building trust). Based on our analysis, large banks that adopt such a concept can save about 13 percent of their costs while also increasing network-driven revenue by 11 percent—an economic equation that should be attractive to most retail bankers. Some banks are already heading in this direction. For example, Virgin Money’s branded boutique lounges in the UK attract some 68,000 visitors monthly, which is helping drive a 200 percent increase in sales at nearby full-service branches. Capital One Cafés are “inviting places” where visitors can relax (with brand-name coffee bars), get in-person financial coaching, engage with others, charge their devices and, yes, bank—all contributing to more engaged users and longer interactions, producing greater brand awareness and sales opportunities. Rather than see their branch networks as millstones to be shrunk and de-emphasized, while trying to avoid negative press attention, forward-thinking banks need to focus on three positive steps to create a better and more productive network that functions as a competitive advantage. Embrace an experience vision and mindset to optimise the branch network and give customers what they really want at physical locations—from relationship-focused offers and communal spaces, to innovative tools like chatbots and virtual reality for digital conversations, to blended retail areas like cafés. These modern branches also need to avoid being Pollyanna-ish and recognise that one of the reasons customers still want to visit a physical location is to complain in person when something goes wrong. So, the design needs to make that a positive experience as well and not assume that everyone is just there to buy. What is clear is that for many incumbents, their traditional temples of finance will never be experience centers, so we are seeing lots of rotation where some branches are closed while new locations are simultaneously being opened. 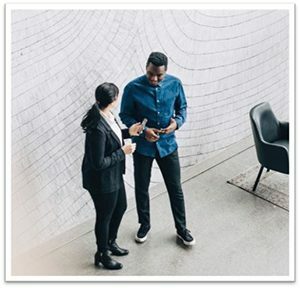 Address the human capital aspect of branches and create a workforce capable of delivering service beyond sales, offering recommendations beyond simple product explanation, and obsessing about keeping the quality and value of human contact at a high level. This means right-fit hires, hard- and soft-skills (trust and empathy) training and easy-to-use technology (based mostly around mobile platforms and devices) that gives staff greater access to more and better information for personalising banking. There is nothing more demoralising for a member of a branch team to realise that the customer has better information on their phone than they do on their PC. Don’t just experiment with flagship branches while the rest of the network languishes in the 1990s. Real transformation means implementing at scale across the reimagined network and building for a dynamic and flexible future—because the role of the branch will continue to change. For example, banks should build modular service blocks that standardise experience-store functions across the network. Doing so will enable selected branch formats to be assembled to suit the local market and be implemented cost-effectively while also providing the flexibility to change them regularly. Banks that shift to an experience store network model can bolster their brand as a destination for customers who want human support, but also want an environment that is welcoming and engaging. 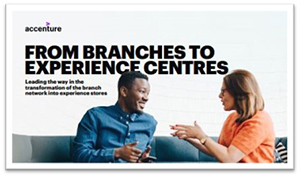 We detail our bank experience store concept in our new report, From Branches to Experience Centres. I invite you to read it to see how your bank can transform its branches.